Finally! The last part of my Chanticleer visit. I suspect I might have gone on a little too long over my visit, but I really did enjoy the trip and the gardens are just the type of plantings I like to see at this time of year. 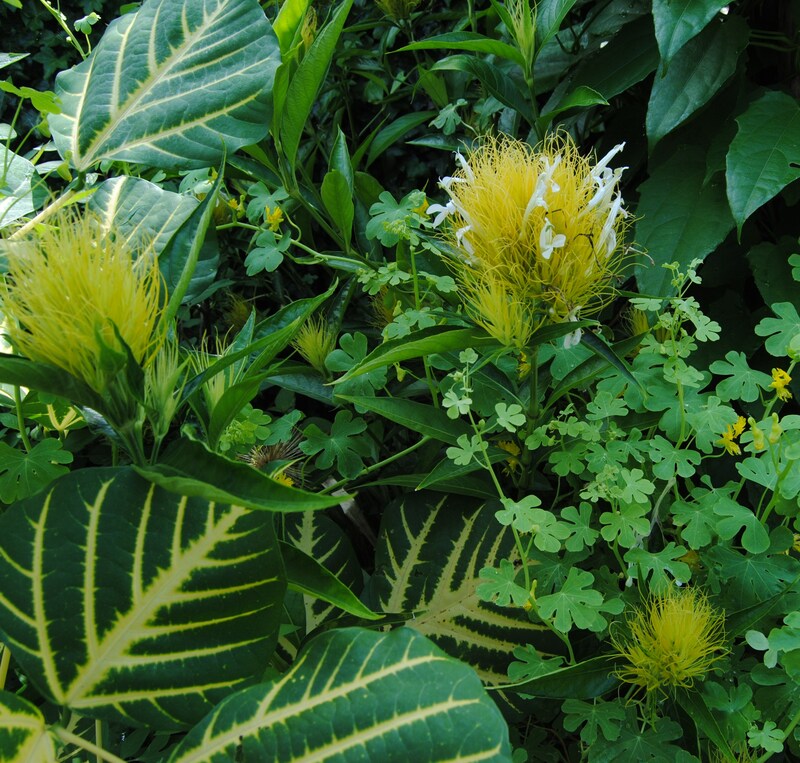 Lush healthy tropical plants putting on their last big hurrah before the first frost cuts them down. Plus I like to use this blog as a photo record of the year, and I’m sure these images will come in handy during the icy days of winter. Here’s the last big stop of the tour, the terrace gardens surrounding the main Chanticleer house. As usual it’s a dose of reality when I see plants from my own garden used to so much better effect. The Japanese maple, variegated Pagoda dogwood “Golden Shadows”, blue ageratum and “limelight” four o’clock near the path…. all look a lot nicer here! 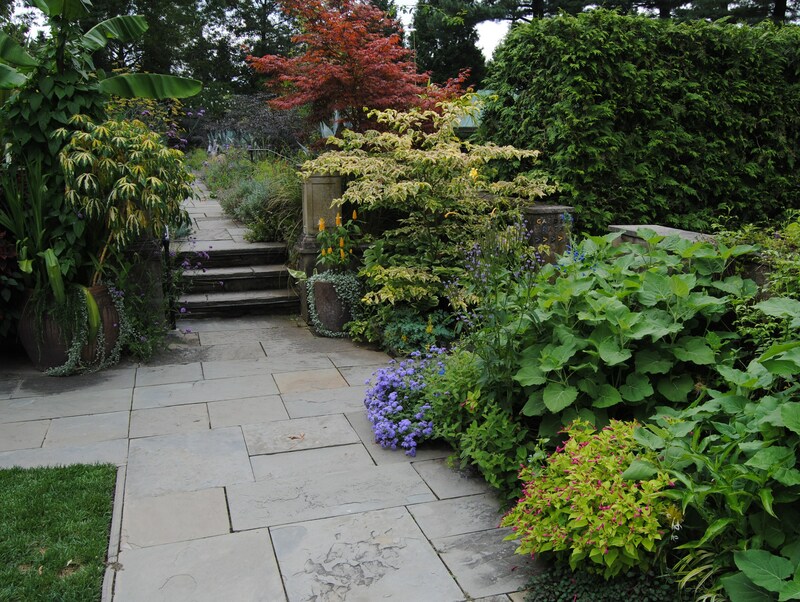 I’m sure a terrace of bluestone pathways and stone steps would help my garden design immensely, but even the bronze fennel, dahlias, and verbena bonariensis look dreamier and fresher here. The blue of the spiky agave helps too…. hmmm I grow that as well. 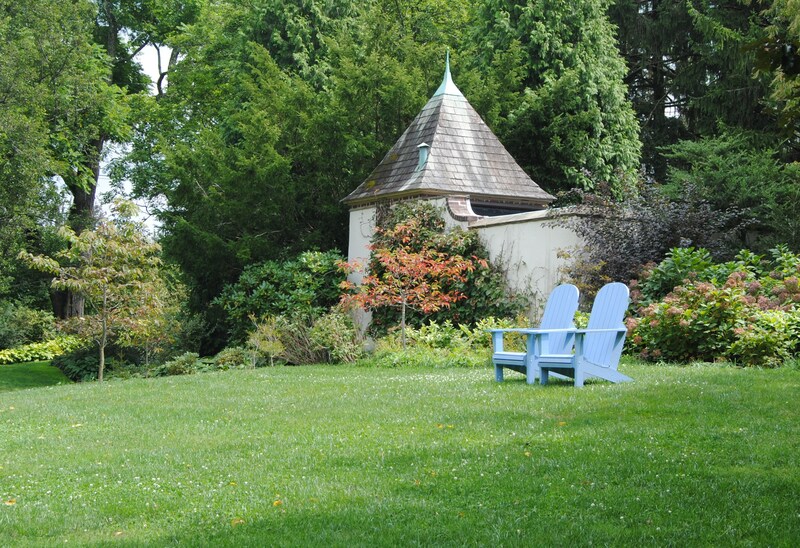 It’s sitting under the deck in a broken clay pot, wishing it were at Chanticleer. The boxwood hedge which I’ve planted around my vegetable garden still needs several years before it reaches this immaculately trimmed state. I like a nice boxwood edging, I think it’s worth the extra work of frequent trimming, and adds a nice touch of control to a bed that might otherwise look to be on the verge of messy. 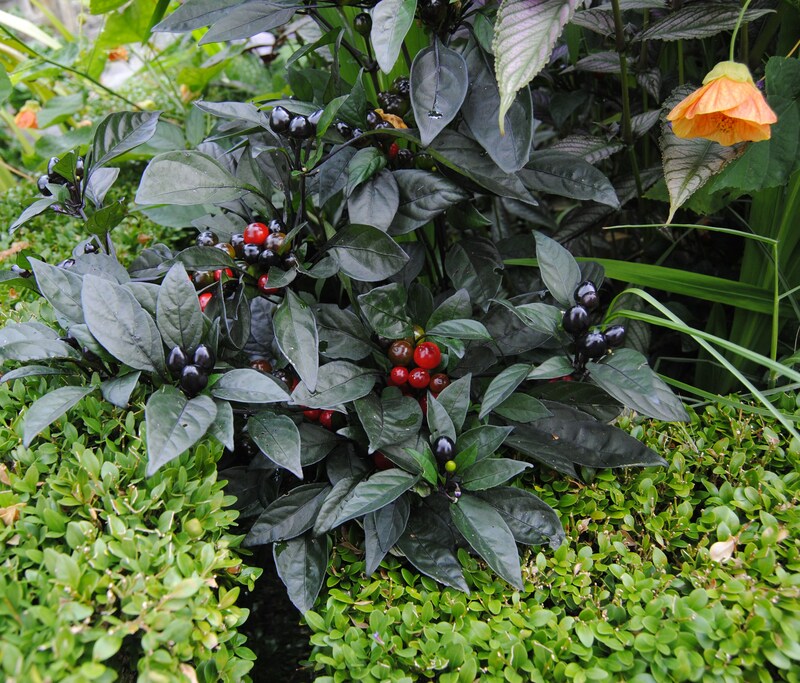 ‘Black Pearl’ ornamental peppers also look great right up against the hedge, and these could easily fit into my future potager. 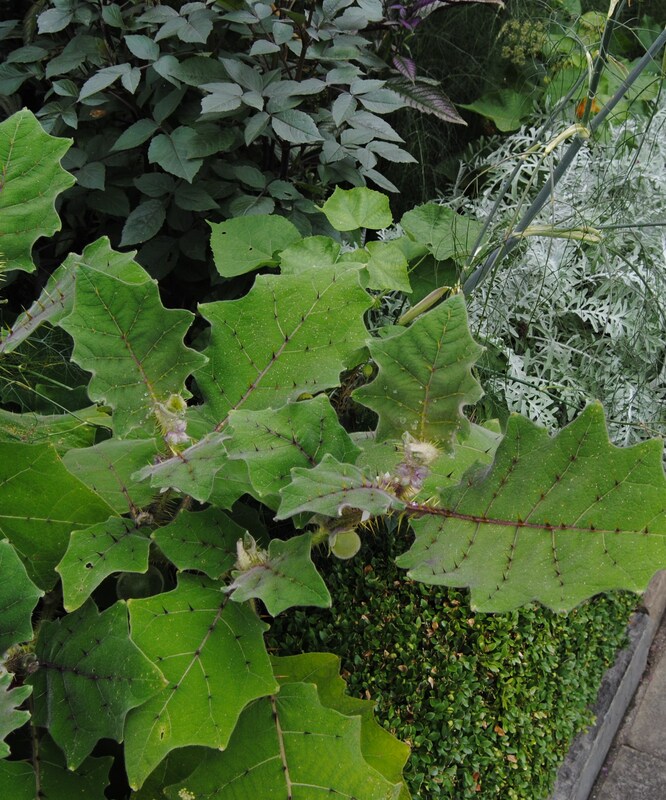 If you’re interested in reading a little more about these plants and some of the thoughts behind the plantings, check out this link at the Hardy Plant Society. Jonathan Wright, the horticulturalist in charge of this part of the garden, wrote a great article on this area and some of the practices used to keep it looking at its peak from March into November. Still in the terrace garden was something new that I liked. An area formerly kept as a cut lawn had been turned over to a flowery meadow of fluffy little red amilias, red dahlias, and violet verbena boanariensis. I wonder if this section will hold over to next year, the grass was boring, but it did give a bit of a calm amidst all the overflowing beds. The area around the house is absolutely crammed with treasures and accents. These huge baskets have more in them than most average gardens. 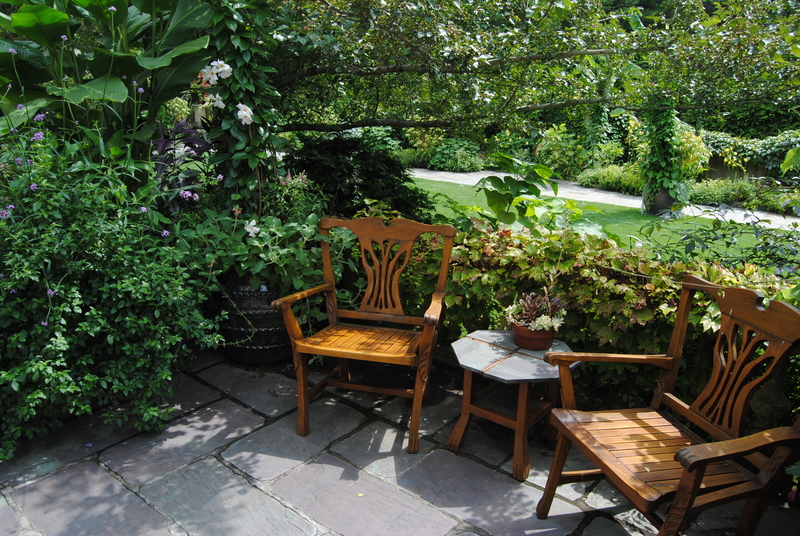 And of course there were plenty of seating areas surrounding the house. A great place to stop for a needed break. Back to red and purple. The purplish upright dracaena is again one I have, and I will definitely copy this combo with the red leaved coleus. I’m almost through my picture horde. One more here for banana lovers. I believe this is the infamous ‘Ae Ae’ variegated banana. First found in Hawaii, it’s a little cranky to grow and therefore a little expensive to buy. Established pups (offshoots of the mother plant) typically run $200-$300 and fraud runs rampant. Don’t buy seeds and don’t buy from a shifty Georgia nursery is all I’ll say (not that I’ve ever considered it). The leaves are really cool looking though and to have it flanking both sides of the main doorway…..
I’ll stick to my yellows and chartreuse. Here’s a yellow leaved redbud, potted ‘mossy’ plants and a circle of raked gravel. Very calming. And so on to the exit. No time to sit, but there was still ample color coordinated seating. I bet someone has fun moving the seats about finding them the perfect spot, a good idea I think. I should keep it in mind next time I’m moving stuff to bring the lawn mower through… not that my dead grass ever needs mowing. Out the front gate. It’s a beautiful locale and I wouldn’t mind living closer, but I have to question whether our housing budget can handle the zipcode. A quick real estate search of Wayne, Pa shows it to be a tad out of our budget. Even with the sale of our current house, just the down payment for properties running in the 1-5 million range would be an issue. I guess we could lower our expectations, but I want the hayfield too. 🙂 Thanks for looking! This entry was posted in garden tours, late summer and tagged bronze fennel, chanticleer, garden art, garden color, garden design, garden photography, garden tour, gardens around philadelphia, Great gardens, Pennsylvania gardens, plants, tropical plants in the garden, Tropicalismo. Thank you once again for taking me through these smashing gardens. It’s amazing: They don’t look tired at all considering the time of year. All so neat, lush and green. Different climate to ours for sure. Yes, very true. I don’t know how much they water, but I believe this year they had more rain than they needed. Many of their plants are taken in and planted out every year, it’s more work than I even want to think about! PA did have more rain than they needed this year, but Chanticleer has quite a few groundskeepers on site too. They are busy working before the 10am opening for the public. As an architect. I was allowed early access and met many of the fine and knowledgeable gardeners who manage the property. Anytime of year at Chanticleer is a treat. It is so well designed to keep interest all year. I think my plants would also like to move there. Heck, they would like moving to my client properties that also have daily groundskeepers, some even living on the property in caretaker houses. I think I need a daily groundskeeper, they could spend all day watering and make my garden look like the rest of Pennsylvania….. green and lush as opposed to brown and fried! I did see several people out and about working in the gardens. I wondered if it was like this every day, in which case I can see a lot of jobs getting done! Seven full time horticulturalists is the number I saw. I’m not sure if this involves interns and such, but it’s a good number of knowledgeable people for the main areas. I only spoke with a few people. They were busy working so I felt awkward interrupting. I did linger around a few of them and eavesdropped on conversations, it was nice hearing experts talking about plants with other pros. I just don’t get that here, even my favorite nursery is a little sparse in the pro department…. wonderful employees and a pleasure to talk to, but just not as experienced as the Chanticleer staff. Nice series, Frank! You’ll be pleased to know the meadow area near the house is still there, filled with dahlias, verbena b., cosmos, etc . . . And many, many butterflies! I actually thought of you and your meadow area when I saw it! And I thought of you when I saw the many huge tropical plants–I’ve never seen elephant ears so huge! Or hanging baskets so full of so many huge plants! Those things must have weighed a hundred pounds! I think all of our plants must wish they lived at Chanticleer! My husband and I read that there are 14 full time gardeners there!